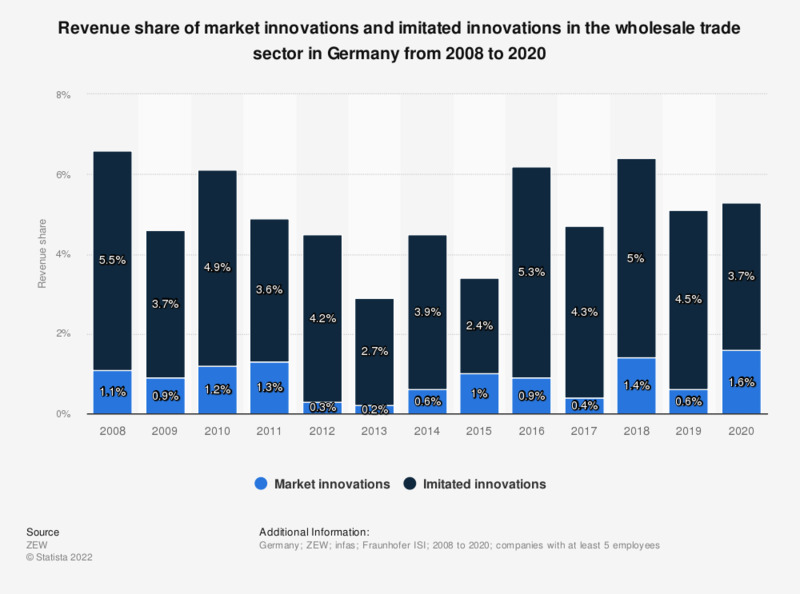 This statistic shows the total revenue share of market innovations and imitated innovations in the software, EDP and information services industry in Germany from 2008 to 2017. In 2017, market innovations had a revenue share of roughly 0.4 percent whereas imitated innovations had a share of roughly 4.3 percent. The term market innovation refers to products, that were newly introduced by companies. Imitated innovations are products that had already been offered by other companies by the time they were introduced to the market. According to the source, the German Innovation Survey has been conducted on behalf of the German Federal Ministry of Education and Research (BMBF) by the Center for European Economic Research (ZEW, Mannheim, Germany) since 1993 in cooperation with the Institute for Applied Social Science (Infas) and the Fraunhofer-Institute for System and Innovation Research (ISI). The survey covers German companies with at least five employees and an economic focus on one of the relevant segment groups. Definitions and evaluation methods correspond to OECD standards and Eurostat. Every two years, the innovation survey is part of the Europe-wide innovation evaluation Community Innovation Survey (CIS) of Eurostat. Figures depict projected base of companies with at least five employees. In 2017, over 17,200 enterprises participated in the survey (= 57% of sample size), of which 640 were wholesalers.